This grave marker is made of crinoidal limestone. In the 1841 census Albert can be seen at the age of six living at Claybrook Hall with his parents and his brothers Henry Thomas Stephen Dicey (10), Edward James Stephen Dicey (9), and Francis William Dicey (3). By 1851 the family had moved to 2 Princes Terrace, Knightsbridge, and of the children only Albert (16) and Francis (13) were at home. Albert was matriculated at the University of Oxford from Balliol College on 23 March 1854 at the age of 19, and gained a First in Literae Humaniores in 1858, just after the death of his father. In 1860 he won a Fellowship by examination at Trinity College, and was a Barrister at Law at the Inner Temple from 26 January 1863. At the time of the 1871 census Dicey (36) was still an unmarried barrister and living with his mother and his brother Francis (an artist in oils) at 50 Onslow Square, Kensington. Elinor Mary Bonham-Carter was born in Westminster in 1837, the youngest daughter of John Bonham-Carter (who had been MP for Portsmouth from 1830 to 1841) and his wife Joanna. In 1851 Elinor (14) was living at Chobham Place, Chobham, Surrey with her widowed mother Joanna and her siblings Joanna (30), Frances (28), Alfred (26), Alice (22), Hugh (18). They had nine servants: a governess, cook, lady's maid, butler, page, coachman, and three housemaids. In October 1872 Albert Venn Dicey forfeited his fellowship at Trinity College when he married Elinor Mary Bonham-Carter. They had no children. At the time of the 1881 census Dicey, a barrister in practice, was living with his wife Elinor at 107 Victoria Street, Westminster with two servants (a cook and a housemaid). The following year he was elected a Fellow of All Souls College under the statutes of the second university commission, which allowed dons to be married. On 8 December 1882 Dicey was appointed to the Vinerian Professorship of Civil Law, to which a Fellowship at All Souls College was attached. On 26 October 1886 he was also elected a Fellow of Balliol College. In 1886 he took out the first lease on a large new house with sixteen rooms called The Orchard (later numbered 80 Banbury Road): this area was transferred to the new St Andrew’s parish in 1906. In 1890 Dicey became a QC. The census the next year shows him living with his wife at 80 Banbury Road with four servants (a cook, parlourmaid, lady’s maid, and housemaid). The situation was much the same in 1901, except that the lady’s maid had been replaced by a between-maid. In 1909 Dicey retired from the Vinerian Professorship. Both Dicey and his wife Elinor were leading opponents of women's suffrage, and in 1910 his book Woman Suffrage: An Appeal to Members of Parliament was published. More information in their involvement can be found in Katherine Bradley's doctoral thesis “Faith, perseverance and patience: the history of the Oxford suffrage and anti-suffrage movements, 1870–1930”. In 1911 Albert Venn Dicey was away on census night, and his wife was in the house with her widowed sister-in-law, Mrs Frances M. Dicey (73) and her four servants. 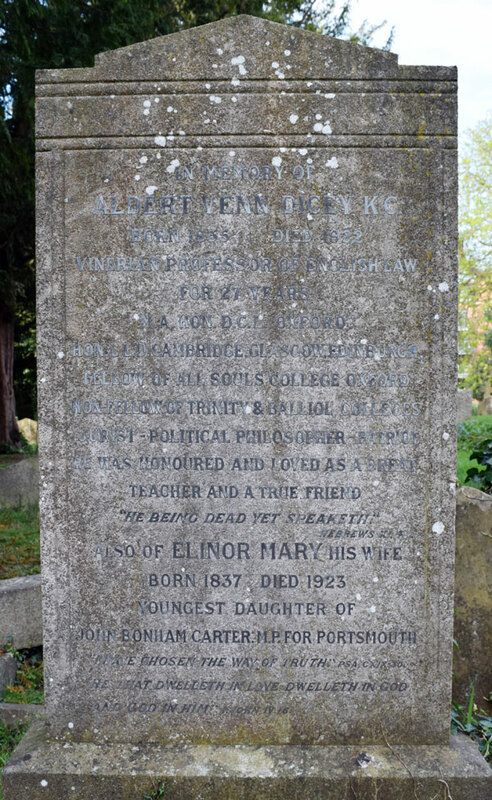 † Albert Venn Dicey died at The Orchard, 80 Banbury Road at the age of 87 on 7 April 1922, and after a funeral service at All Souls College was buried at St Sepulchre’s Cemetery on 10 April (burial recorded in the parish register of St Michael’s Church). Dicey is buried in the St Michael’s section of the cemetery, rather than the St Giles’s section as would have been expected. As the population of St Michael’s parish was going down, it is possible that Balliol College (in the more populous St Mary Magdalen parish) may have purchased some plots in its designated area for its distinguished Fellows, as Balliol’s Benjamin Jowett is also buried there. A GREAT JURIST. PROFESSOR DICEY’S CAREER. CONSTITUTIONAL LAW. In Professor Emeritus Albert Venn Dicey … we lose a jurist of international reputation, whose treatises, especially that on “The Law of the Constitution,” must be ranked among the most masterly in all the wealth of English legal literature. For 27 years he was Vinerian Professor of English Law at Oxford; less than two months ago we recorded the death of his successor, Professor Geldart. Albert Venn Dicey was born at Claybrook on February 4, 1835. He owed everything — the expression is his own — to the wisdom and firmness of his mother. At 15 he went to King’s College School, but he soon had to return home, owing to ill-health. He entered Balliol at Easter, 1854, and duly obtained his firsts in Moderations and in Litt Hum., winning also the Arnold prize for an essay on “The Privy Council.” The exceptional badness of his handwriting was an obstacle to him in competing for Fellowships. When he stood at Trinity, however, Robinson Ellis persuaded his colleagues to allow Dicey the aid of an amanuensis; the result was a brilliant success. In the dialectical activities of the undergraduate world Dicey had his full share; he was a frequent speaker at the Union, and he joined the Old Mortality. After spending his probationary year at Trinity, Dicey went to London to read for the Bar. His master in the law was Butterworth, a pleader of no ordinary skill; he also profited by the advice of his uncle, Mr. Serjeant Stephen. He was called to the Bar by the Inner Temple in 1863, but with all his talent and industry he lacked some of the qualities which attract the notice of solicitors; he therefore wrote steadily for the Press, and devilled for several leaders of the Bar. Also, he determined to write a law-book, and Butterworth suggested the selection of parties to an action as a suitable topic. “Dicey on Parties” appeared in 1870; it still has its place, beside “Stephen of Pleading,” in the libraries of those who aspire to be accomplished common lawyers. In 1872 Dicey married Elinor, daughter of John Bonham-Carter, M.P., and aunt of Sir Maurice Bonham-Carter. At Sir John Holker’s suggestion Dicey was appointed, in 1876, junior counsel to the Commissioners of Inland Revenue. He held this appointment some 15 years, and on retiring from practice he was made a Q.C. In 1879 his reputation as a legal writer was fully established by the publication of his treatise on “Domicil” (he always insisted on spelling the word without an e). The substance of this book is embodies in his larger treatise on “The Conflict of Laws.” These works were very favourably received by American and Continental jurist. In 1882 Dicey was appointed the first Vinerian Professor of the new order, with a Fellowship of All Souls. His lectures were well attended, and he liked to form private classes of the more capable students for the discussion of recent cases. His great ambition was to give a lucid and systematic form to those rules of English law which he understood and to expound and illustrate their underlying principles. The most important result of his Oxford work was the brilliant series of lectures on “The Law of the Constitution” — a book which long ago attained to the rank of a classic. In a later course he set himself to describe the relation between law and public opinion in England during the 19th century. The book displays all the characteristic qualities of Dicey’s mind — his fairness of temper, his extraordinary delight in analysis and arrangement, and his happy use of illustrative quotations. Like most of his relations and college friends, Dicey was a Liberal in politics. His comparative study of Constitutions only confirmed his preference for popular government, as developed in this country. He was keenly interested in all efforts to improve the education of the labouring class, and of the distinctions conferred on him none gave him more pleasure than the Principalship of the Working Men’s College in London. While holding that office he was one of the very few leading men who came out into the open in opposing the Trades Disputes Act. Though always a fairly good party man, he never attempted to enter the House of Commons, and he was over 50 when he intervened, for the first time, in a great political controversy. From the moment when the Home Rule Bill of 1886 was before the country Dicey had no doubts, and he devoted all his debating and literary power to the cause of Liberal Unionism. He would speak at any local meeting, however small. His “England’s Case Against Home Rule” (1886) belongs to the first period of the controversy; “The Verdict” (1890) sets forth the true meaning of the findings of the Parnell Commission: and the revised version of Home Rule in 1893 was subjected to an unsparing examination in “A Leap in the Dark.” His last work was one on the union between England and Scotland, written with Professor Rait. In 1909 Dicey retired from the Vinerian Professorship, and the University conferred on him the title of Professor Emeritus in recognition of his services. Since the death of Lord Bryce he had been the senior of the honorary Fellows of Trinity. Intellectually as keen as ever, he often visited All Souls, and the younger Fellows looked forward eagerly to a chance of hearing his brilliant conversation. Nor did his interest in public affairs flag; during the war period many letters from him appeared in the Times, dealing in a masterly manner with various legal and constitutional questions. He was always glad to see old friends and new at his house in Oxford, and all left it with the impression of his great knowledge, untiring interest, and brilliance of exposition. Of late years his strange figure, with its abstracted look and shuffling gait, was not often seen in the streets of Oxford, but his name commanded the same respect as ever. Dicey’s estate at death came to £23,068 11s. 0d. A brass tablet memorial to him was placed on the west wall of the chapel of All Souls College. † Mrs Elinor Mary Dicey, née Bonham Carter died at the age of 86 on 28 November 1923 and was buried with her husband at St Sepulchre’s Cemetery (burial probably recorded in the parish register of St Andrew’s Church). Her estate came to £41,141, and she left £1,000 to Balliol College, £900 to the Working Men’s College in Crowndale Road, London, £500 to Somerville College, £100 to the Radcliffe Infirmary (and a further gift of £100 on the death of Annie Wynne Thackeray), £100 to the National Association for Promoting the Welfare of the Feeble-Minded at Botley, £100 to the Sarah Acland Memorial District Nurses’ Home, Oxford, £100 to Esther Kate Smith, her parlourmaid; £100 to Mary Kennedy, her nurse; £40 to Elsie Mary Kenn, her cook, and £50 to Annie Rose Keen, her parlourmaid. Dicey’s house at 80 Banbury Road was demolished in the 1970s to make way for the Murray Court flats.